Worst service ever! Had my transmission rebuilt by them in June of 2011. Within a month, problems started. When in reverse, would jump around. Took it back to them, they told me it was a timing issue?? Took to another shop, they told me no way it was a timing issue, it is all controlled by the computer, and there was no faults showing. Took it back to Ammco, and had to leave it there for three days, and pay for a rental out of my own pocket, this after spending nearly $4000.00 for the "repair" Finally get it back, and it is good for about two months. Coming into work one day, its starts slipping. By the time I get to work, only have 1st gear. Call up these wonderful people, and am quickly told, have it woed in, at my expense, and they will look at it. I work in Richmond, and the tow was going to cost me about 200 bucks. I told them, if they will not pay for the tow, I will have it towed to Ammco in Vancouver, which is much closer. I was told, do whatever I like! Great service, thanks for the help! I towed it to the Ammco on Arbutus, and they said out said, Ammco Surrey messed up the rebuild, and did not tighten some things correctly, causing it to fail. Few days later, get the truck back. Next day, notice smoke coming from underneath the truck. Take it back to Arbutus, and then say the transmission oil pan is leaking, so replaced it. Couple weeks later, get the oil changed, and they tell me I have a leak, from transmission pan! Back to Ammco, they changed the gasket again. Couple days later, smoke again! I gave up with Ammco, and took my truck to Mr Transmission on 104th in Surrey. Fixed it in less than an hour, and have not had a problem since! NEVER AGAIN WILL I GO TO AMMCO!!!! Worst experience ever with a so called repair shop. Stay far away from these people! OUTSTANDING SERVICE: Ive always been told, if you find a good mechanic, hang on to them. And we all know in this day and age its hard to find a trust worthy and resonble person to work on your car. 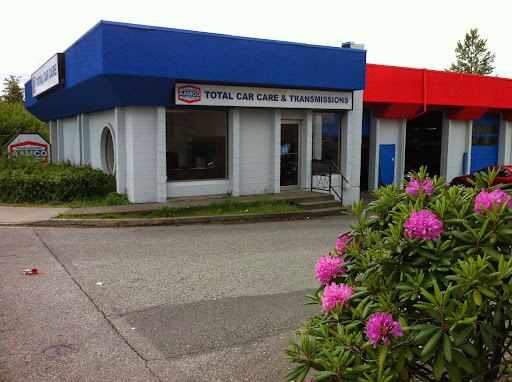 Well ive found that place, I recently brought my vehicle into Aamco Transmissions in Surrey. I let them know I was having issues with my vehicle and they addressed it accordingly, they brought it in and checked it out at no charge to me, who does that? Most shops will charge you an hours labor before they even bring your car into the shop. With that being said, they correctly identified the problem and fixed it on time and on budget, as the car was in the shop they had also mentioned a few other issues that needed to be brought to my attention, and instead of making me feel as if I was being up-sold on parts for something I do not need, they actually brought me inside the work place , introduced me to the mechanics and physcially showed me what was happening and what they had discovered. Truely a shop of integrity, friendlyness and most of all fairness. I would recommend this shop to ANYONE, friends family and co-workers. Thanks for the outstanding service Aamco! I went to this business and waited 10-15 minutes with no service, went out to one of the bays and asked and finally someone came to help. Had the oil pan gasket of the transmission replaced. After a couple of days I still had a leak. Returned in the morning at the time posted for opening and finally someone showed up 20 minutes later. He barely spoke English. Another man arrived a few minutes later, and was the least bit interested. After taking a look under my car they "werent sure what the problem was and I would have to leave it for several hours" Not having a lot of faith in the place I took it elsewhere to find that they had missed a couple of problems. Terrible service and not sure they actually know what they are doing. This is the place to go. Service is wonderful! Staff is friendly, efficient and knowledgeable! Mechanics know their stuff! Not to mention this is family owned. Rod and Karen are customer service driven! Ive had my transmission rebuilt here among other repairs after being having no luck at other shops. My car has given me issue after issue and this is the only shop that has taken the time to address the actual problems. Ill be coming here with all my other vehicles for everything down to the oil changes. Make sure you check this place out next time you need something done to your vehicle!! I cant stress enough how impressed I am with this shop! Brought my 2004 Murano here as adviced by global warranty. They checked and explained well whats wrong with the car (rear diff and right axle problem)and how does warranty works, found out that it is not covered yet as it has not been a month since I bought it. They told me to contact the dealer which I did, I was told theyll take it back to their lot and have it fixed. They did not charge for the test drive and for diagnosing the problem, they understood my situation, very polite and honest staff and helpful. I will definitely come back here for my cars oil changes and maintenance.